June 27, 2018 | By Fatima V.
Dallas Plano Marriott at Legacy Town Center collected travel size toiletries and donated these items to our patient/ family support cart for their Spirit2Serve activity. 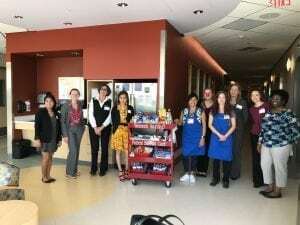 The patient/ family support cart is put together by the Plano Women’s Auxiliary; twice a week they pull a cart full of toiletries and snacks around the hospital and offer free travel sized items to patients and families. Thank you to Dallas Plano Marriott at Legacy Town Center for making this possible! Previous post: W Hotel Ice Cream Social for Spirit2Serve Week!